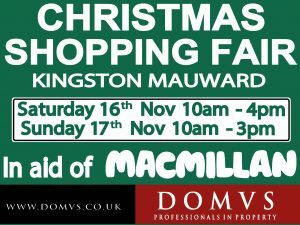 DOMVS is delighted to be supporting the highly popular Macmillan Christmas Shopping Fair, which is being held on Saturday 16th and Sunday 17th November 2019 at Kingston Maurward College. Over the last thirty years, it is estimated that the fair has raised nearly £300,000 for Macmillan Cancer Support, and the Committee are hoping that this year proves to be one of their most successful yet. The fair is open on Saturday 16th November from 10am until 4pm and on Sunday 17th November from 10am until 3.30pm. Admission is £5 per person. Further information about the Macmillan Christmas Shopping Fair together with a selection of this year’s stallholders can be found on their website www.macmillanchristmasfair.co.uk or by liking their Facebook Page.